Home picture of the day Flame On! What causes some stars to rapidly fluctuate in brightness? The Electronic Sun theory postulates that sunspots, solar flares, anomalous coronal heating, and coronal mass ejections on the Sun are due to changes in the electrical supply that it receives from the galaxy. In other words, the Sun is powered externally not internally, and it is not a self-regulating fusion reactor. Rather, Birkeland current filaments carry electricity through the Milky Way, supplying the Sun with more or less power as they go. Glowing, braided filaments are sometimes visible in “jets” that blast out from stars and some galaxies. Those filaments are also Birkeland currents, and they are the visible portion of enormous electric circuits that form a large-scale structure in the Universe. The circuits generate magnetic fields that can be mapped, so the helical shape characteristic of Birkeland currents is known, since it can be seen. Various components coupled to and driven by electric circuits in space comprise the heart of Electric Universe theory. Charged particles accelerating through powerful electric fields radiate energy in many bandwidths. Changing conditions within Birkeland currents can alter the radiation patterns throughout some galaxies over time. The massive filament observed in association with the May 12, 2013 solar prominence eruption that spawned three X-class solar flares in twenty-four hours reveals its electrical parentage. Fortunately, it was not an Earth-facing event, and the Sun has not been so violent for several months since that date. In an Electric Universe, plasma discharge behavior is thought to be the best model for solar activity. Laboratory experiments with a positively charged sphere show that a plasma torus forms above its equator. Electric discharges bridge the torus with the middle and lower latitudes of the sphere. Spicules are consistent with the principle of “anode tufting,” a plasma discharge effect expected of a positively charged electric Sun. Closeup images of sunspot filaments, seen clearly in sunspot penumbrae, indicate that they are whirling charge vortices. Looking down into a sunspot means seeing the rotating discharge columns in profile. Electric discharges in plasma form rope-like, hollow tendrils. Since they are funnels of plasma, their centers are darker, where convection cells would appear darker at their edges. Standard theory does not accept that the darker and cooler regions revealed by sunspots means that the Sun is cooler in its interior. Conventional thinking suggests that the Sun accelerates charged particles into space in the same way that sound waves are amplified. Eruptions in the photosphere travel outward through “acoustical wave-guides,” known as magnetic flux tubes. Structures called spicules rise thousands of kilometers above the photosphere and carry the hot gas with them. 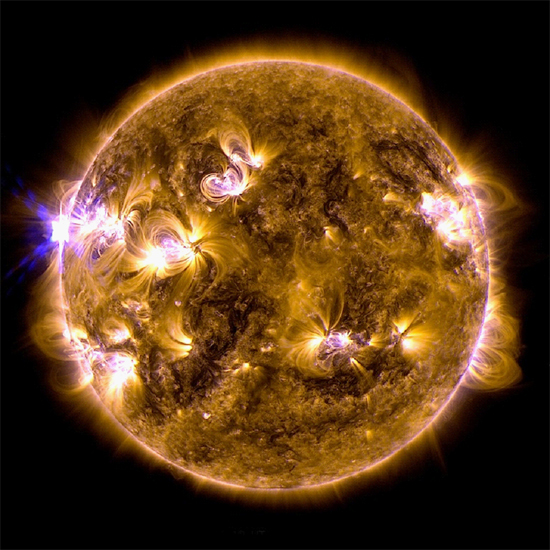 Standard theories about the Sun also suggest that there is “conveyor belt” circulating solar matter down into magnetically active zones inside the interior, where it is “reenergized.” When sunspot magnetic fields begin to decline, the conveyor belt is said to pull what’s left inside the Sun. As an article from NASA states, they are drawn 300,000 kilometers below the surface, there to be re-magnetized by the “solar dynamo.” The sunspots become buoyant in the plasma flow, rising back up to the photosphere to start a new solar cycle. 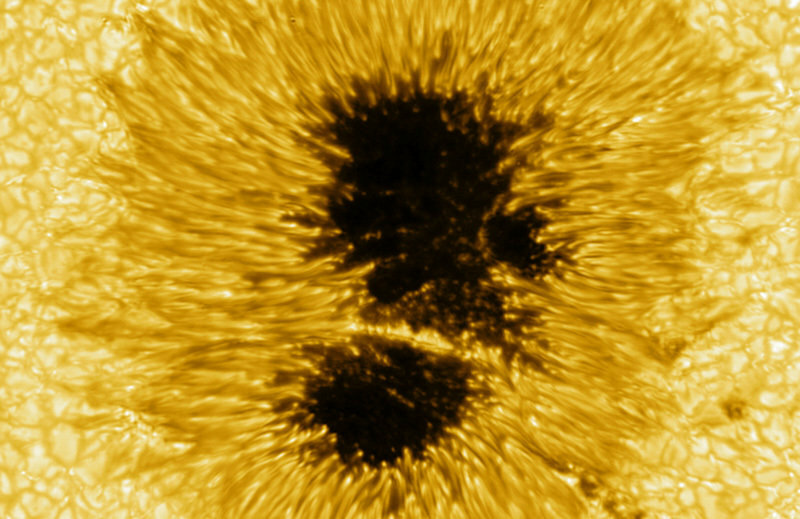 Coronal arches and multiple loop structures connect sunspots and rise up to penetrate the chromosphere. The chromosphere is a plasma sheath, or double layer region of the Sun, where most of its electrical energy is contained. When the current flowing into the Sun’s plasma sheath increases beyond a critical threshold it can trigger a sudden release of that energy, causing solar flares and enormous prominence eruptions. Powerful looping electric currents generate secondary toroidal magnetic fields that surround the loop. When the current grows too strong, the plasma double layer is destroyed. 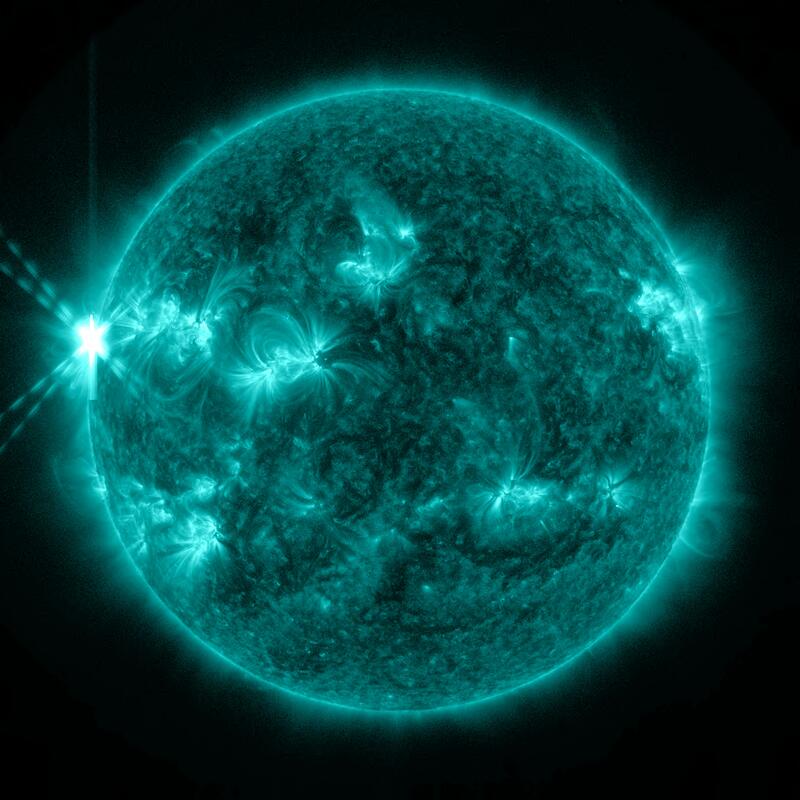 That event interrupts the current flow and the stored electromagnetic energy is blasted into space as a solar flare. Solar flares can therefore be thought of as tremendous lightning bursts, discharging vast quantities of matter at near relativistic speeds.